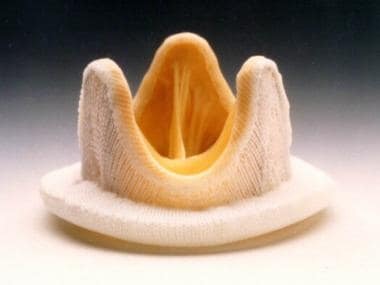 Bioprosthetic valves (see the image below) used in heart valve replacement generally offer functional properties (eg, hemodynamics, resistance to thrombosis) that are more similar to those of native valves. Implantation of prosthetic cardiac valves to treat hemodynamically significant aortic or mitral valve disease has become increasingly common. The Hancock M.O. II aortic bioprosthesis (porcine). Reproduced with permission from Medtronic, Inc. Replacement of diseased valves with prosthetic heart valves reduces the morbidity and mortality associated with native valvular disease, but it comes at the expense of risking complications related to the implanted prosthetic device. Emergency medicine physicians must be able to rapidly identify patients at risk and begin appropriate diagnostic testing, stabilization, and treatment. Even when promptly recognized and treated, acute prosthetic valve failure is associated with a high mortality rate. In propensity-matched comparisons, actuarial 15-year mortality rates were 60.6% with the bioprosthetic aortic valve and 62.1% with the mechanical valve. Cumulative 15-year stroke rates were 7.7% and 8.6% in the two groups, respectively. The reoperation rate was 12.1% in the bioprosthetic valve group at 15 years and 6.9% in the mechanical valve group, while major bleeding occurred in 6.6% of bioprosthesis patients and in 13.0% of the mechanical-valve group. A history of fever should raise the possibility of prosthetic valve endocarditis (PVE). In patients with acute valvular failure, diagnostic studies must be performed simultaneously with resuscitative efforts. Implantation of prosthetic cardiac valves to treat hemodynamically significant valvular disease has become an increasingly common procedure. It is estimated that 60,000-95,000 patients per year are undergoing heart valve replacement in the United States. Bioprosthetic valves used in heart valve replacement generally offer functional properties (eg, hemodynamics, resistance to thrombosis) that are more similar to those of native valves. Implantation of prosthetic cardiac valves to treat hemodynamically significant aortic or mitral valve disease has become increasingly common. Replacement of diseased valves reduces the morbidity and mortality associated with native valvular disease but comes at the expense of risking complications related to the implanted prosthetic device. These complications include primary valve failure, prosthetic valve endocarditis (PVE), prosthetic valve thrombosis (PVT), thromboembolism, and mechanical hemolytic anemia. In addition, because many of these patients require long-term anticoagulation, anticoagulant-related hemorrhage may occur. Transcatheter approaches to aortic valve implantation have allowed patients previously felt to be poor operative risks to undergo valve replacement. Emergency medicine physicians must be able to rapidly identify patients at risk and begin appropriate diagnostic testing, stabilization, and treatment. Even when promptly recognized and treated, acute prosthetic valve failure is associated with a high mortality rate. Three main designs of mechanical valves exist: the caged ball valve, the tilting disc (single leaflet) valve, and the bileaflet valve. The only Food and Drug Administration (FDA)–approved caged ball valve is the Starr-Edwards valve, shown in the image below. Starr-Edwards Silastic ball valve mitral Model 6120. Reproduced with permission from Baxter International, Inc.
Tilting disc valve models include the Medtronic Hall valve, shown in the image below, Omnicarbon (Medical CV) valves, Monostrut (Alliance Medical Technologies), and the discontinued Bjork-Shiley valves. Medtronic Hall mitral valve. Reproduced with permission from Medtronic, Inc.
Bileaflet valves include the St. Jude (St. Jude Medical), shown in the image below, which is the most commonly implanted valve in the United States; CarboMedics valves (Sulzer CarboMedics); ATS Open Pivot valves (ATS Medical); and On-X and Conform-X valves (MCRI). 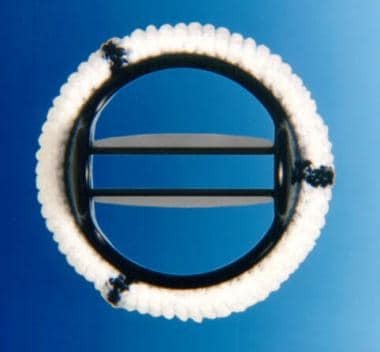 St. Jude Medical mechanical heart valve. Photograph courtesy of St. Jude Medical, Inc. All rights reserved. St. Jude Medical is a registered trademark of St. Jude Medical, Inc.
Bioprosthetic (xenograft) valves are made from porcine valves or bovine pericardium. Porcine models include the Carpentier-Edwards valves (Edwards Lifesciences) and Hancock II and Mosaic valves (Medtronic); both valves are shown in the images below. 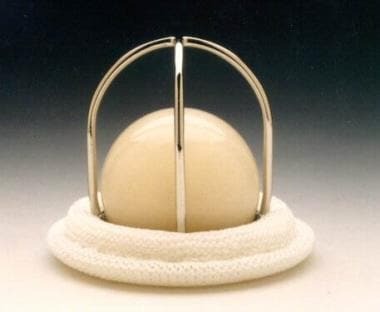 Carpentier-Edwards Duralex mitral bioprosthesis (porcine). Reproduced with permission from Baxter International, Inc.
Homografts or preserved human aortic valves are used in a minority of patients. Two devices have been approved for transcatheter aortic valve implantation (TAVI): the SAPIEN XT valve (Edwards LifeSciences), made of bovine pericardium, and the CoreValve (Medtronic), made of porcine pericardium. The American College of Cardiology/American Heart Association (ACC/AHA) recommendations for aortic valve replacement in patients with valvular aortic stenosis (AS) are summarized in the list below. In most adults with symptomatic severe AS, aortic valve replacement (AVR) is the surgical treatment of choice. If concomitant coronary disease is present, AVR and coronary artery bypass graft (CABG) surgery should be performed simultaneously. Successful AVR produces substantial clinical and hemodynamic improvement in patients with AS, including octogenarians. AVR should be performed in all symptomatic patients with severe AS regardless of left ventricular (LV) function, as survival is better with surgical treatment than with medical treatment. Candidates for percutaneous aortic valve placement must have severe, symptomatic aortic stenosis with formal contraindications for conventional aortic valve surgery or other characteristics that would limit the patient's surgical candidacy because of excessive morbidity or mortality. The procedure should be offered to patients who would gain functional improvement from the procedure and not because they refuse conventional operation. Under current ACC/AHA guidelines, aortic valve surgery is recommended for patients with chronic, severe aortic regurgitation (AR) when the patient is symptomatic. It is also recommended in the asymptomatic patient with chronic, severe AR who has a resting ejection fraction (EF) of 50% or less or left ventricular dilatation. Additional circumstances in which aortic valve surgery may be reasonable are listed below. Surgical treatment of AR usually requires replacement of the diseased valve with a prosthetic valve, although valve-sparing repair is increasingly possible with advances in surgical technique and technology. Symptomatic patients with moderate to severe MS who also have moderate to severe MR should receive mitral valve replacement (MVR) unless valve repair is possible at the time of surgery (Class I). Mitral valve replacement is reasonable in patients with severe MS and severe pulmonary hypertension (pulmonary artery systolic pressure >60 mm Hg) who have NYHA functional Class I–II symptoms and who are not considered candidates for percutaneous mitral balloon valvotomy or surgical mitral valve repair (Class IIa). In addition, according to the recommendations, patient preference is a reasonable consideration in the selection of aortic valve operation and valve prosthesis. A mechanical prosthesis is reasonable for AVR in patients younger than age 65 years who do not have a contraindication to anticoagulation. A bioprosthesis is reasonable for AVR in patients younger than 65 years who elect to receive this valve for lifestyle considerations after detailed discussions of the risks of anticoagulation versus the likelihood that a second AVR may be necessary in the future (Class IIa). 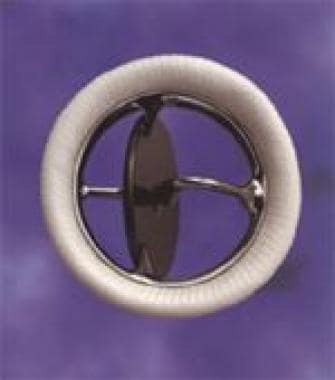 A bioprosthesis is reasonable for MVR in patients younger than age 65 years in sinus rhythm who elect to receive this valve for lifestyle considerations after detailed discussions of the risks of anticoagulation versus the likelihood that a second MVR may be necessary in the future (Class IIa). Reoperation rate after AVR was higher with the bioprosthetic valve than with the mechanical valve (29 ± 5% vs 10 ± 3%). Valve-related deaths after AVR accounted for 41% of all deaths in the bioprosthetic group and 37% in the mechanical valve group; valve-related deaths after MVR were 57% and 44% of all deaths, respectively. Primary valve failure was significantly greater with bioprosthetic valves for AVR (bioprosthetic vs mechanical, 23 ± 5% vs 0 ± 0%) and for MVR (44 ± 8% vs 5 ± 4%). Almost all the primary valve failures were in patients younger than age 65 years (18 of 20 patients in the AVR group and 20 of 21 patients in the MVR group). Bleeding occurred more frequently in patients with a mechanical valve than in those with a bioprosthesis (AVR, 51 ± 4% vs 30 ± 4%; MVR, 53 ± 7% vs 31 ± 6%). No statistically significant differences were seen between the two valve groups for systemic embolism, infective endocarditis, or valve thrombosis. Primary valve failure may occur abruptly from the tearing or breakage of components or from a thrombus suddenly impinging on leaflet mobility. More commonly, valve failure presents gradually from calcifications or thrombus formation. Bioprostheses are less thrombogenic than mechanical valves, but this advantage is balanced by their diminished durability when compared with mechanical valves. Although 30-35% of bioprostheses will fail within 10-15 years, it can be anticipated that most mechanical valves will remain functional for 20-30 years. Stenosis or incompetence of prosthetic valves occurs and may be due to a tear or perforation of the valve cusp, valvular thrombosis, pannus formation, valve calcification, or stiffening of the leaflets. Primary failure of mechanical valves may be caused by suture line dehiscence, thrombus formation, or breakage or separation of the valve components. Acute valvular regurgitation or embolization of the valve fragments may result. When the mitral valve acutely fails, rapid left atrial volume overload causes increased left atrial pressure. Pulmonary venous congestion and, ultimately, pulmonary edema occur. Cardiac output is decreased because a portion of the left ventricular output is being regurgitated into the left atrium. The compensatory mechanism of increased sympathetic tone increases the heart rate and the systemic vascular resistance (SVR). This may worsen the situation by decreasing diastolic filling time and impeding left ventricular outflow, thereby increasing the regurgitation. Acute failure of a prosthetic aortic valve causes a rapidly progressive left ventricular volume overload. Increased left ventricular diastolic pressure results in pulmonary congestion and edema. The cardiac output is reduced substantially. The compensatory mechanism of an increased heart rate and a positive inotropic state, mediated by increased sympathetic tone, partly helps to maintain output. However, this is hampered by an increase in SVR, which impedes forward flow. Increased systolic wall tension causes a rise in myocardial oxygen consumption. Myocardial ischemia in acute aortic regurgitation may occur, even in the absence of coronary artery disease. 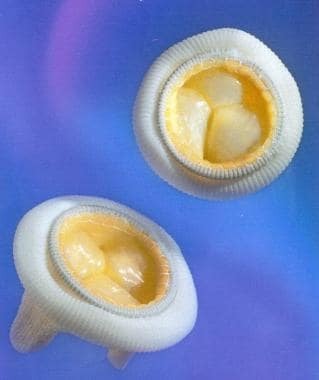 Biological prosthetic valves often slowly degenerate over time, become calcified, or suffer from thrombus formation. These events result in the slowly progressive failure of the valve. The presentation is usually that of gradually worsening congestive heart failure, with increasing dyspnea. Alternatively, patients may present with unstable angina or systemic embolization, or they may be entirely asymptomatic. The pathologic hallmark of PVE in mechanical valves is ring abscesses. Ring abscess may lead to valve dehiscence and perivalvular leakage. Local extension results in the formation of myocardial abscesses. Further extension to the conduction system often results in a new atrioventricular block. Valve stenosis and purulent pericarditis occur less frequently. Bioprosthetic valve PVE usually causes leaflet tears or perforations. Valve stenosis is more common with bioprosthetic valves than with mechanical valves. Ring abscess, purulent pericarditis, and myocardial abscesses are much less frequent in bioprosthetic valve PVE. Finally, glomerulonephritis, mycotic aneurysms, systemic embolization, and metastatic abscesses also may complicate PVE. Prosthetic valve thrombosis is more common in mechanical valves. With proper anticoagulation, the rate of thrombosis in all valves is within the range of 0.1-5.7% per patient-year. Caged ball valves have the highest rate of thromboembolic complications, and bileaflet valves have the lowest. Valve thrombosis is increased with valves in the mitral position and in patients with subtherapeutic anticoagulation. Anticoagulant-related hemorrhagic complications of mechanical valves include major hemorrhage in 1-3% of patients per year and minor hemorrhage in 4-8% of patients per year. Low-grade hemolytic anemia occurs in 70% of prosthetic heart valve recipients, and severe hemolytic anemia occurs in 3%. The incidence is increased with caged ball valves and in those with perivalvular leaks. Primary valve failure occurs in 3-4% of patients with bioprostheses within 5 years of implantation and in up to 35% of patients within 15 years. Mechanical valves have a much lower incidence of primary failure. Fatal anticoagulant-induced hemorrhage occurs in 0.5% of patients per year. In children, bioprostheses rapidly calcify and, therefore, undergo rapid degeneration and valve dysfunction. Incidence of bioprosthetic failure is much higher in patients younger than 40 years. The incidence of having any prosthetic valve complication decreases with age. Chiang YP, Chikwe J, Moskowitz AJ, Itagaki S, Adams DH, Egorova NN. Survival and long-term outcomes following bioprosthetic vs mechanical aortic valve replacement in patients aged 50 to 69 years. JAMA. 2014 Oct 1. 312(13):1323-9. [Medline]. O'Riordan M. Survival and stroke rates equivalent at 15 years with mechanical and bioprosthetic aortic valves. Heartwire. September 30, 2014. [Full Text]. O’Riordan M. SCCT policy statement recommends CT prior to TAVI/TAVR procedures. Medscape Medical News. Jan 11, 2013. [Full Text]. Achenbach S, Delgado V, Hausleiter J, Schoenhagen P, Min JK, Leipsic JA. SCCT expert consensus document on computed tomography imaging before transcatheter aortic valve implantation (TAVI)/transcatheter aortic valve replacement (TAVR). J Cardiovasc Comput Tomogr. 2012 Nov. 6(6):366-80. [Medline]. Whitlock RP, Sun JC, Fremes SE, Rubens FD, Teoh KH,. Antithrombotic and thrombolytic therapy for valvular disease: Antithrombotic Therapy and Prevention of Thrombosis, 9th ed: American College of Chest Physicians Evidence-Based Clinical Practice Guidelines. Chest. 2012 Feb. 141(2 Suppl):e576S-600S. [Medline]. Van de Werf F, Brueckmann M, Connolly SJ, Friedman J, Granger CB, Härtter S, et al. A comparison of dabigatran etexilate with warfarin in patients with mechanical heart valves: THE Randomized, phase II study to evaluate the safety and pharmacokinetics of oral dabigatran etexilate in patients after heart valve replacement (RE-ALIGN). Am Heart J. 2012 Jun. 163(6):931-937.e1. [Medline]. Pibarot P, Dumesnil JG. Prosthetic heart valves: selection of the optimal prosthesis and long-term management. Circulation. 2009 Feb 24. 119(7):1034-48. [Medline]. [Guideline] Bonow RO, Carabello BA, Chatterjee K, et al for the American College of Cardiology/American Heart Association Task Force on Practice Guidelines. 2008 focused update incorporated into the ACC/AHA 2006 guidelines for the management of patients with valvular heart disease: a report of the American College of Cardiology/American Heart Association Task Force on Practice Guidelines (Writing Committee to revise the 1998 guidelines for the management of patients with valvular heart disease). Endorsed by the Society of Cardiovascular Anesthesiologists, Society for Cardiovascular Angiography and Interventions, and Society of Thoracic Surgeons. J Am Coll Cardiol. 2008 Sep 23. 52(13):e1-142. [Medline]. [Full Text]. Hammermeister K, Sethi GK, Henderson WG, Grover FL, Oprian C, Rahimtoola SH. Outcomes 15 years after valve replacement with a mechanical versus a bioprosthetic valve: final report of the Veterans Affairs randomized trial. J Am Coll Cardiol. 2000 Oct. 36(4):1152-8. [Medline]. Oxenham H, Bloomfield P, Wheatley DJ, et al. Twenty year comparison of a Bjork-Shiley mechanical heart valve with porcine bioprostheses. Heart. 2003 Jul. 89(7):715-21. [Medline]. [Full Text]. Bates MG, Matthews IG, Fazal IA, Turley AJ. Postoperative permanent pacemaker implantation in patients undergoing trans-catheter aortic valve implantation: what is the incidence and are there any predicting factors?. Interact Cardiovasc Thorac Surg. 2011 Feb. 12(2):243-53. [Medline]. Habib G, Thuny F, Avierinos JF. Prosthetic valve endocarditis: current approach and therapeutic options. Prog Cardiovasc Dis. 2008 Jan-Feb. 50(4):274-81. [Medline]. Nataloni M, Pergolini M, Rescigno G, Mocchegiani R. Prosthetic valve endocarditis. J Cardiovasc Med (Hagerstown). 2010 Dec. 11(12):869-83. [Medline]. Akhtar RP, Abid AR, Zafar H, Khan JS. Aniticoagulation in patients following prosthetic heart valve replacement. Ann Thorac Cardiovasc Surg. 2009 Feb. 15(1):10-7. [Medline]. Daniels PR, McBane RD, Litin SC, Ward SA, Hodge DO, Dowling NF, et al. Peri-procedural anticoagulation management of mechanical prosthetic heart valve patients. Thromb Res. 2009 Feb 19. [Medline]. Botta L, Bechan R, Yilmaz A, Di Bartolomeo R. Prosthetic valve endocarditis due to Brucella: successful outcome with a combined strategy. J Cardiovasc Med (Hagerstown). 2009 Mar. 10(3):257-8. [Medline]. Jeejeebhoy FM. Prosthetic heart valves and management during pregnancy. Can Fam Physician. 2009 Feb. 55(2):155-7. [Medline]. Shapira Y, Vaturi M, Sagie A. Hemolysis associated with prosthetic heart valves: a review. Cardiol Rev. 2009 May-Jun. 17(3):121-4. [Medline]. Lengyel M. Diagnosis and treatment of left-sided prosthetic valve thrombosis. Expert Rev Cardiovasc Ther. 2008 Jan. 6(1):85-93. [Medline]. Yaffee DW, Smith DE 3rd, Ursomanno PA, et al. Management of blood transfusion in aortic valve surgery: impact of a blood conservation strategy. Ann Thorac Surg. 2013 Nov 19. [Medline]. Janeczko LL. Blood conservation strategy helpful in aortic valve replacement. Reuters Health Information. December 16, 2013. [Full Text]. Brennan JM, Edwards FH, Zhao Y, et al. Early anticoagulation of bioprosthetic aortic valves in older patients: results from the Society of Thoracic Surgeons Adult Cardiac Surgery National Database. J Am Coll Cardiol. 2012 Sep 11. 60(11):971-7. [Medline]. Nishimura RA, Carabello BA, Faxon DP, et al. ACC/AHA 2008 guideline update on valvular heart disease: focused update on infective endocarditis: a report of the American College of Cardiology/American Heart Association Task Force on Practice Guidelines endorsed by the Society of Cardiovascular Anesthesiologists, Society for Cardiovascular Angiography and Interventions, and Society of Thoracic Surgeons. Catheter Cardiovasc Interv. 2008 Sep 1. 72(3):E1-12. [Medline]. [Guideline] Horstkotte D, Follath F, Gutschik E, Lengyel M, Oto A, Pavie A, et al. Guidelines on prevention, diagnosis and treatment of infective endocarditis. The Task Force on Infective Endocarditis of the European Society of Cardiology. France: European Society of Cardiology. 2004. [Full Text]. American College of Obstetricians and Gynecologists. ACOG Committee Opinion: safety of Lovenox in pregnancy. Obstet Gynecol. 2002 Oct. 100(4):845-6. [Medline]. Baddour LM, Wilson WR, Bayer AS. Infective endocarditis: diagnosis, antimicrobial therapy, and management of complications. Circulation. 2005 Jun 14. 111(23):e394-434. [Medline]. Bussey HI. An overview of anticoagulants, antiplatelet agents, and the combination in patients with mechanical heart valves. J Heart Valve Dis. 2004 May. 13(3):319-24. [Medline]. Butany J, Ahluwalia MS, Munroe C, et al. Mechanical heart valve prostheses: identification and evaluation (erratum). Cardiovasc Pathol. 2003 Nov-Dec. 12(6):322-44. [Medline]. Butany J, Fayet C, Ahluwalia MS, et al. Biological replacement heart valves. Identification and evaluation. Cardiovasc Pathol. 2003 May-Jun. 12(3):119-39. [Medline]. Cannegieter SC, Rosendaal FR, Briet E. Thromboembolic and bleeding complications in patients with mechanical heart valve prostheses. Circulation. 1994 Feb. 89(2):635-41. [Medline]. [Guideline] Dajani AS, Taubert KA, Wilson W, et al. Prevention of bacterial endocarditis. Recommendations by the American Heart Association. Circulation. 1997 Jul 1. 96(1):358-66. [Medline]. Das M, Twomey D, Al Khaddour A, Dunning J. Is thrombolysis or surgery the best option for acute prosthetic valve thrombosis?. Interact Cardiovasc Thorac Surg. 2007 Dec. 6(6):806-11. [Medline]. Goldman ME. Echocardiographic doppler evaluation of prosthetic valve function and dysfunction. Adv Cardiol. 2004. 41:179-84. [Medline]. Kahn S. Long-term outcomes with mechanical and tissue valves. J Heart Valve Dis. 2002. 11, Suppl 1:S8-S14. [Guideline] Lengyel M, Fuster V, Keltai M, et al. Guidelines for management of left-sided prosthetic valve thrombosis: a role for thrombolytic therapy. Consensus Conference on Prosthetic Valve Thrombosis. J Am Coll Cardiol. 1997 Nov 15. 30(6):1521-6. [Medline]. MacKenzie GS, Heinle SK. Echocardiography and Doppler assessment of prosthetic heart valves with transesophageal echocardiography. Crit Care Clin. 1996 Apr. 12(2):383-409. [Medline]. Mehlman DJ. A pictorial and radiographic guide for identification of prosthetic heart valve devices. Prog Cardiovasc Dis. 1988 May-Jun. 30(6):441-64. [Medline]. O'Riordan M. FDA Approves Medtronic's CoreValve for Inoperable Patients. Medscape [serial online]. Available at http://www.medscape.com/viewarticle/819376. Accessed: January 26, 2014. Piper C, Kprfer R, Horstkotte D. Prosthetic valve endocarditis. Heart. 2001 May. 85(5):590-3. [Medline]. Roudaut R, Lafitte S, Roudaut MF, et al. Fibrinolysis of mechanical prosthetic valve thrombosis: a single-center study of 127 cases. J Am Coll Cardiol. 2003 Feb 19. 41(4):653-8. [Medline]. Stein PD, Alpert JS, Bussey HI, et al. Antithrombotic therapy in patients with mechanical and biological prosthetic heart valves. Chest. 2001 Jan. 119(1 Suppl):220S-227S. [Medline]. Vongpatanasin W, Hillis LD, Lange RA. Prosthetic heart valves. N Engl J Med. 1996 Aug 8. 335(6):407-16. [Medline]. Willson A, Webb J. Transcatheter treatment approaches for aortic valve disease. Int J Cardiovasc Imaging. 2011 Dec. 27(8):1123-32. [Medline]. Carpentier-Edwards Perimount pericardial aortic bioprosthesis. Reproduced with permission from Baxter International, Inc.
Edwards Sapien transcatheter aortic valve.